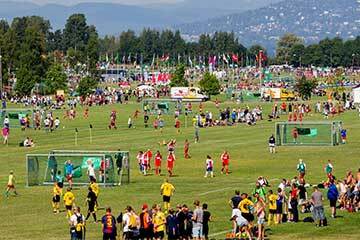 Norway Cup is the world’s largest football tournament for children and young people aged 10 to 19 years old, with 3v3 soccer for players 6-10 years old played the last weekend of the tournament. In 2016 we reached an all time high with 2199 teams participating in Norway Cup. Around 6000 games were played over the course of the tournament in 2016. Norway Cup all started in 1972 with 420 teams and 8,400 participants. Overall through the years, participants, players and referees from 127 nations have participated. In addition, Norway Cup is by many considered to be women’s football’s cradle in Norway. We have had girls teams participate from the start with eight girls teams taking part in 1972. This was four years before the Norwegian Football Association officially recognized women’s football. Both young and old work to make this a wonderful football party in Oslo to remember. The youngest is five and the oldest, Norway Cups grandmother, (Rigmor Andresen) will turn 95 in 2017. In addition, more than 600 volunteers from our co-organizers help create the world’s biggest football tournament. Vision: Norway Cup’s vision is to become the world’s largest and most important arena for the joy of sports and friendship. Core values: inclusive – friendship – joy – innovative – professional. The Kon-Tiki museum, Viking Museum, “Fram” museum (arctic museum) and the Norwegian Museum of Cultural History are on the “Bygdøy Island”, which can be accessed by boat (which is also for free with the NC-cards).